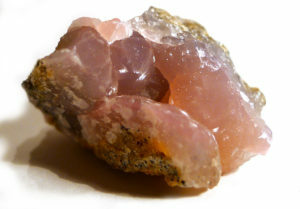 Warm, soft, gentle and nurturing, smithsonite supports the immune system and can assist in balancing thyroid function. 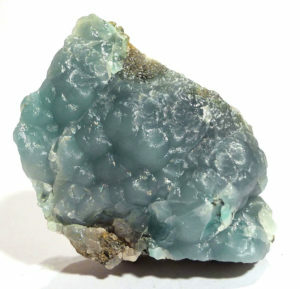 Smithsonite is useful for letting go of deep emotional pain, particularly for adults who were abused or felt unloved as children. The effect will be a gentle and subtle healing rather than a cathartic but traumatic release. It is also used in the treatment of osteoporosis, helping the bones to hold calcium, and is useful in treating sinus problems, as well as strengthening psychic abilities. Held at the Crown Chakra, it aligns the Chakras and allows the energy to flow, and also enhances communication with the Angelic Realm. 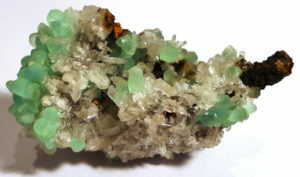 Smithsonite is a relatively common mineral, found in the oxidation zones of zinc ore deposits, and is frequently mined as a zinc ore. It forms botryoidal or stalactitic masses, or honeycombed aggregates. Colouration is colourless, white, blue, green, yellow, brown, pink and pink-purple.